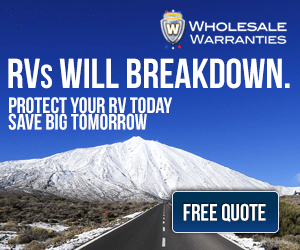 Our large 21 foot Dometic 9100 RV power awning is made out of vinyl and has held up very well after 4 years of full-time RVing. I generally clean it every few months by following the procedure outlined in the owner’s manual. 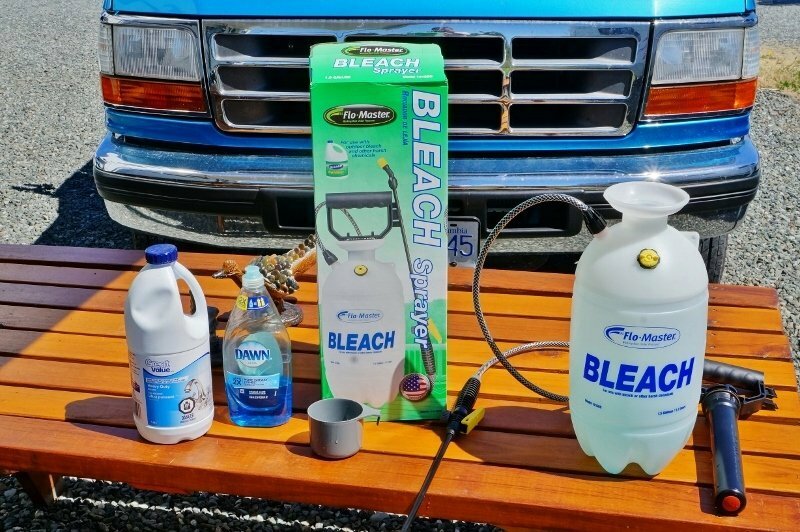 The manual advises using a mixture of ¼ cup bleach, ¼ cup dishwashing liquid added to 5 gallons of water. It then states to spray this solution liberally all over the top of the awning and roll it back up. 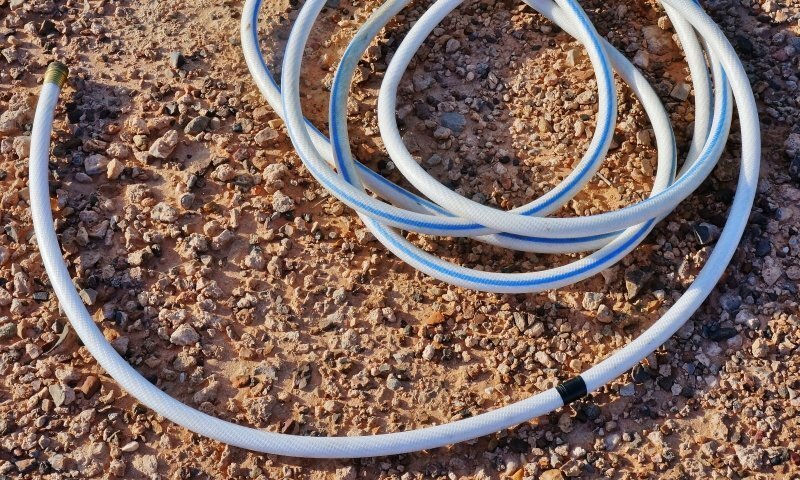 Wait about 5 minutes, unroll the awning and hose it off well with fresh water. I have my own little method of doing this. 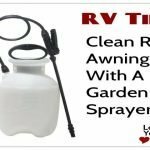 I use a 1.5-gallon manual pump garden sprayer filled with water and add about 1/8th cup of bleach and 1/8th cup of Dawn dish soap. I give the open awning a good hose off to remove any loose debris then spray the top side down with my garden sprayer. I then roll her back up and wait 10 or 15 minutes. After finishing off my beverage of choice, I unroll the awning and give it a really good rinse. You want to make sure all the bleach is gone or it may damage the fabric threads holding the awning together. I may do the cleaning procedure 2 or 3 times depending how dirty the awning is. 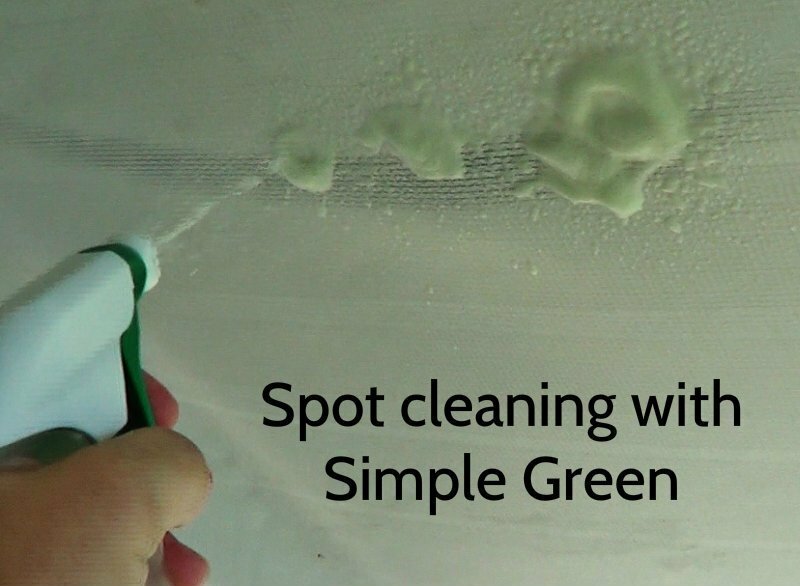 To complete the awning clean, I use something called Simple Green spray cleaner. 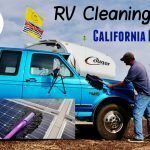 I use it to clean any stubborn stains that may be left over and also clean the arm levers and slider mechanisms, then rinse again. 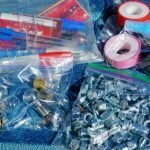 The owner’s manual for the 9100 Dometic power awning states to use a silicone lubricant. 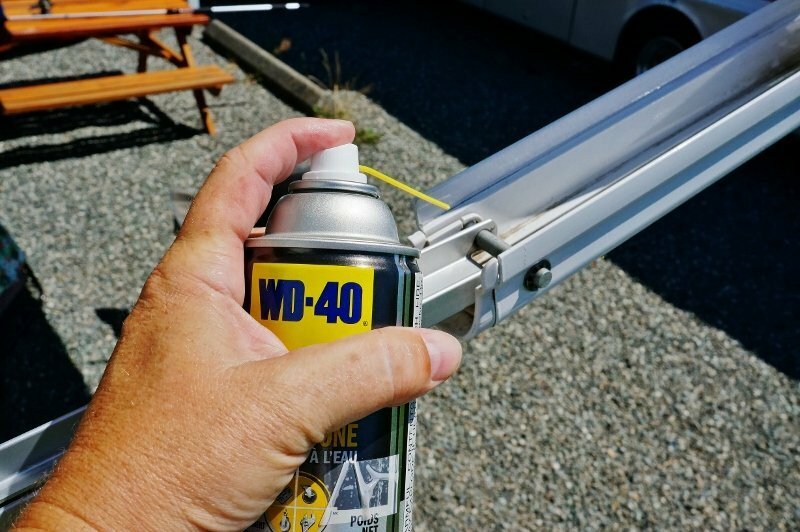 I spray a silicone based lubricant into all the awning’s arm joints and at each end of the long roller tube. I also apply the lubricant to the adjuster thumb screw, slide groove and on the exposed piston rod. I then open and close the awning multiple times to work the lubricant in. Our Keystone Cougar remote comes in handy at this point allowing me to relax my camp chair while hard at work maintaining the rig. 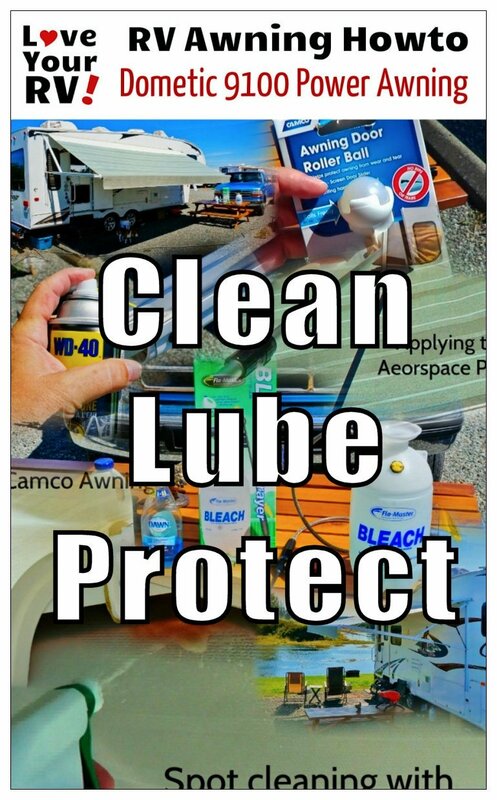 Once the awning is all clean and lubed I use a product called 303 Aerospace Protectant to finish things off. 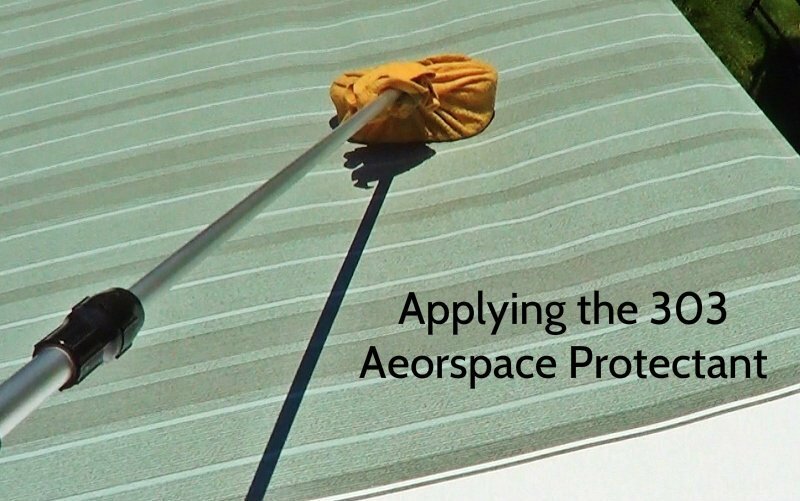 The 303 Aerospace Protectant keeps the sun and elements from causing the awning vinyl to fade and crack, extending its lifespan. 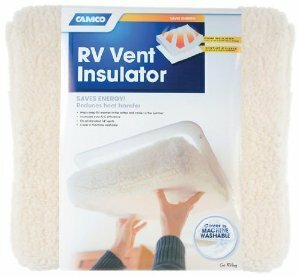 To get at the hard to reach areas I use my long RV washing brush with a chamois cloth wrapped around it. 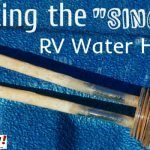 When our awning is tilted to shed rain water our RVs entrance door rubs on the awning when open. 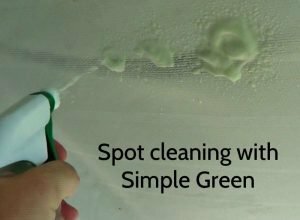 This creates a black streak on the underside and could eventually cause permanent damage. 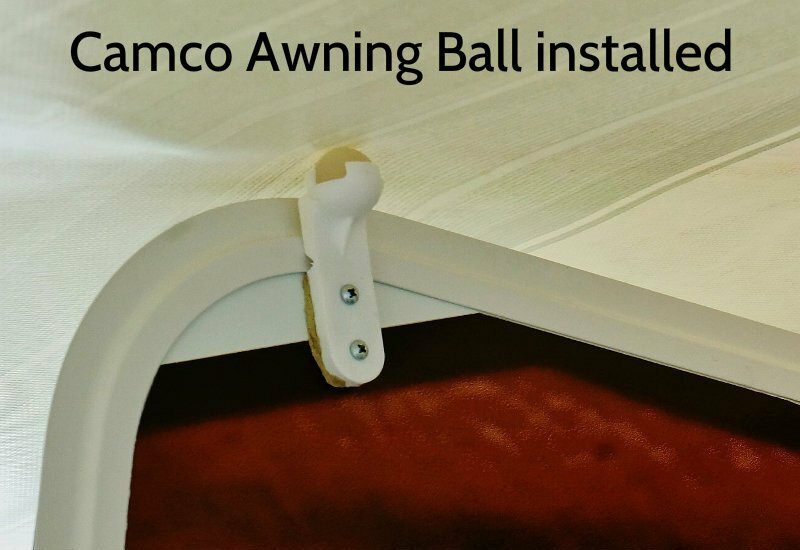 So to prevent that I’ve installed a neat little gadget called an Awning Roller Ball from Camco. 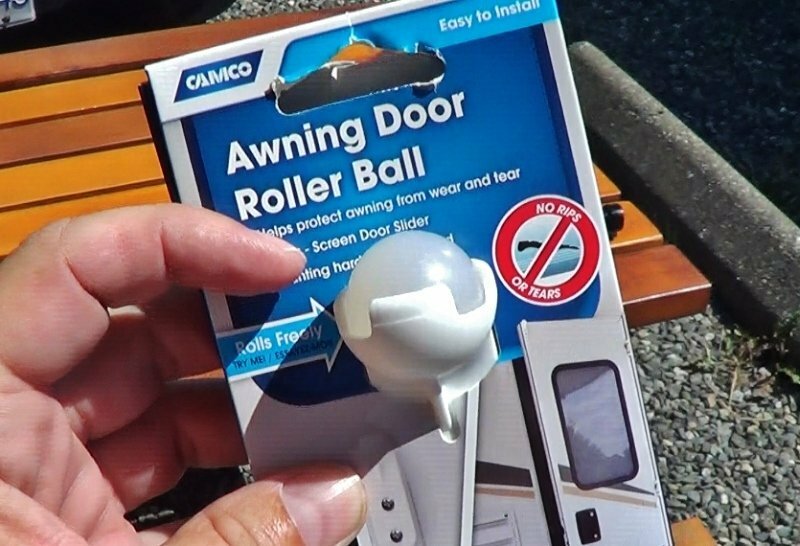 It attaches to the door with two screws and on the end has a slick round plastic ball that glides across the awning fabric instead of the metal door edge. Now that the awning is whistle clean and shiny new looking it’s a good time to inspect the hardware and tighten up any loose screws. I also check the electrical connection for corrosion, the stitching and clean out any debris that may have jammed up in the gutter above the awning. Awing Failure Tip – I’ve always wondered what the heck I would do if the power awning one day failed and wouldn’t retract. Turns out there are to possible courses of action if this happens to my Dometic 9100 awning. On the arm closest to the trailer front end is a 12-volt wire connection. You can unplug it and apply 12 volts from an external supply or battery and see if it will fire up the motor. If it doesn’t budge then go to option number two. 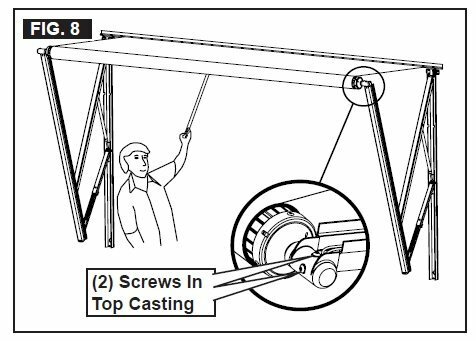 Attach an included strap to a groove in the long awning roller and get a friend to hold onto it. 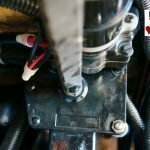 Next unplug the power connector and remove the two 5/32 hex key screws located on the awning tube end closest to the front of the RV. The awning should roll up manually. Then add back the two screws so you can travel with the broken awning. 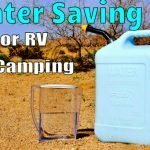 Share this post with other RVers, thanks!